No matter where they live or work, health professionals, researchers, and the public can access information from the National Library of Medicine thanks to its National Network of Libraries of Medicine, consisting of more than 6,000 libraries coordinated by the NLM and supported by eight Regional Medical Libraries (RMLs). NLM in Focus is showcasing RMLs for 2011-2016. In this article we introduce you to the people and projects of the Southeastern/Atlantic Region (SE/A). Stretching from the nation’s capital and adjacent Maryland and Virginia before dropping down along the Gulf Coast and into the deep south, and reaching over to the US Virgin Islands and Puerto Rico, the Southeastern/Atlantic (SE/A) Region is a rich mosaic of urban, rural and remote areas. Headquartered in Baltimore at the University of Maryland Health Sciences and Human Services Library, the SE/A Region supports collaboration among 34 resource libraries and more than 1,000 network members, including hospital libraries and community-based organizations, located across Alabama, the District of Columbia, Florida, Georgia, Maryland, Mississippi, North Carolina, Puerto Rico, South Carolina, Tennessee, Virginia, the Virgin Islands, and West Virginia. The region includes three of the 10 wealthiest states or federal districts (DC, Maryland, and Virginia), as well as four of the poorest (Alabama, Mississippi, South Carolina, and West Virginia). NLM in Focus spoke recently with SE/A Director M.J. Tooey and Executive Director J. Dale Prince. We serve a huge geographic area with a fourth of the country’s people and some of its busiest, most populous cities, as well as remote rural areas, particularly in Appalachia and West Virginia. Our region contains important information and research centers, including the Library of Congress, the Centers for Disease Control and Prevention (CDC), and the NLM. Ours is a real mix, from federal agencies and world-class medical centers like the NIH to many special and underserved populations. Our region includes a large black population and is home to 72 percent of the Historically Black Colleges and Universities. The Asian and Hispanic populations are growing, along with Cuban Americans and Haitians in Florida, Puerto Ricans, and residents of the U.S. Virgin Islands. Each group has its own customs, culture, and sometimes language that we need to accommodate and understand. The region is full of contrasts. 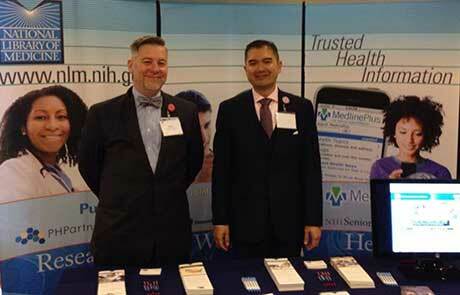 Southeastern/Atlantic Region Executive Director Dale Prince and Communications Coordinator Tony Nguyen promote NLM resources at a conference. We rely on a decentralized approach for delivering programs. The region is simply too large to approach our mission any other way. Most staff work out of our Baltimore headquarters, but we rely on our network members in each state to take the initiative and do the bulk of the outreach. They propose and monitor programs and stay connected. We assign a coordinator to each state or region to oversee projects and programs. Our coordinators travel extensively to meet with people in their states or regions. We know them and understand their needs. Personal connections are so important for maintaining a robust health information outreach effort such as ours. Helping underserved military families. In recent years, we funded the Military Partners and Family Coalition (MPFC), an organization supporting lesbian, gay, bisexual, transgender and similarly identified (LGBT) military families. We got involved when we realized that many military families are “hidden” and consequently underserved. We worked to obtain MPFC and NN/LM funding, and then reached out to those families, gathered baseline data on their physical and mental health needs and whether they were being met, and produced the MPFC Community Health Care Study Report 2011-2012. We are also extremely proud to have helped support Marilyn Lance-Robb, founder/owner of MaFlo’s Health & Awareness Team/MaFlo’s Beauty Salon, and her work in Georgetown, SC. She is using computers with Wi-Fi internet access at MaFlo’s as part of an innovative program to bring health information to her customers. In Parrottsville, TN, we support Karin Hoffman, the Director of the Migrant Health Program for Rural Medical Services, Inc. (RMS), which operates several primary care clinics in the state. Three of the RMS clinics have bilingual staff capable of serving Spanish speakers, and they provide outreach to the Hispanic population with home visits, emergency follow-up, outreach clinics at farm worker labor camps and housing areas, and health education. We’re pleased with our program that pays the processing fees of many MLA Consumer Health Information Specializations and Disaster Information Specializations. We now are piloting a project in Maryland and West Virginia to provide free registration to any public librarian who wishes to acquire either or both of these specializations. Our most important accomplishment, and one at which we are constantly working, is maintaining our quality standing in the eyes of our network members. Based upon Mid-Contract Review surveys of our network base and discussions with representative groups of members who dealt with us recently, either through funding or classes, we have maintained those important relationships. Although the new contract format was challenging to work with given our outreach needs, our members remain appreciative. Technology is always a challenge because there is always something new. We stay alert and scramble to keep up. For outreach though, we wouldn’t be where we are without technology. We use Adobe Connect for daily, weekly, and monthly meetings. Technology allows us to connect and serve our populations almost instantly. Members of the RML staff are accessible all of the time via Skype, text messages, and email. We use Facebook, Twitter, and our own blogs to spread the word or update our remote sites. Our SEA Currents newsletter blog is very popular. We Skype a lot for remote, face-to-face meetings and we still fax occasionally. Accessibility is a serious issue, not just in remote regions but in cities, too. Some users can’t or won’t use technology; some still don’t have access to the Internet or mobile devices. Verma Walker of the NIH Library demonstrates a 3-D printer available for patron use, as part of the District of Columbia Area Health Sciences Libraries fall meeting in Bethesda, MD. The Southeastern/Atlantic Region’s Tony Nguyen joins Elizabeth Norton from the NLM Disaster Information Management Research Center in exhibiting at the Preparedness Summit in Atlanta. What we do best is “build capacity.” That is, through our network, our educational outreach, and our funding, we enable network members to perform more and better outreach. We are proud of the way our network members are able to take our offerings and do wonderful things with them. Our goal is to develop partnerships within the region. And when you speak of partnerships, we have a great variety. We already mentioned Marilyn Lance-Robb and Karin Hoffman, but we also support people like Rick Wallace, who received the 2013 Michael E. DeBakey Library Services Outreach Award from the Friends of the National Library of Medicine. He has devoted his life to serving rural and underserved populations. Rick’s project, “A Simple Plan,” provided instruction for public librarians across the 500-mile width of Tennessee. His team traveled thousands of miles over a 6-year period, performing outreach to roughly 1,000 people and helped 250 receive the MLA Consumer Health Information Specialization. He also works with 20 rural hospitals, 20 rural clinics, and many public health departments to provide remote library access. Additionally he’s gone on to target specific consumer health populations. He says that none of this would be possible without NN/LM. We provide training and professional development opportunities to those who directly provide health information to the public, including network and other librarians, health professionals (including public health professionals), educators, health advocates, and those working with various community-based organizations. Part of that effort involves helping people understand the Affordable Care Act, its benefits, and how to apply and obtain primary care and preventive services. It is always about the people, always about making it easier for people to access quality health information. People in the region know our staff. We are not some distant entity. We try to connect, to understand their needs and ask them, “How can we help?” There always is a need for good programs and health information, and that’s what drives us. We meet new people and hear new ideas. We forge relationships and, together, we make a difference. July 10, 2015 in Programs & Services.